You know what words strike fear into my heart? “Bring a gift that costs less than $5.” Basically, you know you’re going to go home with a bottle of Bath and Body Works lotion. It turns out, I could think of a lot of things I like that are less than $5. And when I asked Kayla for her suggestions, we decided to make a little gift guide. 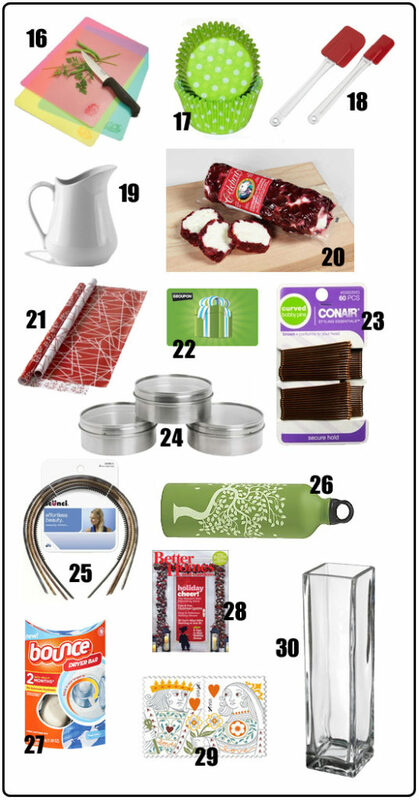 We both came up with 30 items that ring up at less than $5 and that we’d be more than happy to take home with us. 1. Parchment Paper – I’ve been converted in recent years to the glory of baking with parchment paper. It makes cooking and clean up such a breeze. But it’s just a little bit pricy for me (around $4 a roll at the grocery store or Michales). As a gift? I’d be hoarding this like crazy. 2. Spice Jars – I love these little spice jars (4 for $3.99). I’d check out the bulk section of your local grocery store and fill them up with some fun spices, like smoked paprika or nutmeg. 3. Belt from Forever 21 – Belts are such an easy, quick way to spice up an outfit, the size doesn’t matter much, and I’ve been pleasantly surprised with how well my cheap belts have held up. They have tons of options under $5 at Forever 21. 4. Knit hat – I love the fun colors of this hat. Also the price is hard to beat – I don’t think you could MAKE it for this little. 5. Creamy White Chili in a Bag – How popular would this be around the holidays, when it’s a little crazy and making dinner seems like a giant chore? Toss an onion, a 1 lb bag of white beans, a can of chicken broth, a can of diced green chiles, a bag of all the spices from this recipe, and the recipe. They can toss it all, with two frozen chicken breasts, right into the crockpot, add some sour cream at the end of the day, and, presto! Dinner. 6. Movie candy and RedBox codes – Buy a box of popcorn (usually 3 for $1) or a bag of popcorn kernels, if that’s more your style (usually about 80 cents a bag) and a box or two of movie candies (if you’re buying for me, I’d suggestion Junior Mints and Raisinets). Add a little card with a couple of codes for a free movie at Redbox or Blockbuster express (Google some) and you’ve got a movie night at home. 7. Nail Polish – I love nail polish, especially in fun, unusual colors. Pick up three or four for $1 each at the drug or grocery store (maybe a grey, , tie a ribbon around the top and, ta-da! 8. Candle warmer – Michael’s sells these for $4.99 each, but with one of those ubiquitous 40% off coupons (does anyone buy things for full price at Michael’s? ), it’ll be even cheaper. I love using the candles I have this way. 10. Pyramid Stud Earrings – With a curious baby on the loose at my house, stud earrings are a much safer bet for me these days. I like the twist on a classic here. For $1.50, that’s hard to beat. 11. Gloves – Even in relatively warm places (like Arizona and Texas), there are still days when you just NEED gloves. Target has pretty sets of two – one solid, one patterned – for $2 (in stores only, apparently, as I can’t track them down on their website). One for your purse, one for the glove box. 12. Notecards – I love to buy packs of 10 at Michaels in the dollar bins (and then use a 40% off coupon, of course). I have a wide variety of colors and styles and I love having so many to choose from when I sit down to write a thank you card or a birthday note. 13. Letter Tray – Target has this pretty, light-weight letter tray for $4.99. I love how this would look on a desk or counter top. It comes in several colors and patterns. 14. Bic Pens – These cheap pens ($1.44 for ten) are my favorite pens in the entire world. Bart and I both hoard them like they are expensive desk pens. Also, they must be blue. 15. Mini Prep Bowls – I saw several sets of these at my local Ross – some were square, some were round, some were multiple colors while others were all the same. How fantastic to not have to pull out a big bowl when you only need a couple of tablespoons of something. $4.99 or less. 16. Cutting Board – Cutting boards are one of those things I don’t think you can own enough of. This pack of three is less than $5, or you can buy them inexpensively at Marshall’s, Ross, or TJ Maxx. 17. Muffin Liners – These make muffins or cupcakes so easy to eat on the go and make them seem special too. Michael’s has a huge variety, usually for about $2 for 30 – 50. One of those things you might not buy for yourself, but are really fun to have around. 18. Spatula Scrapers – Another thing I never have enough of. I don’t like the ones that are kind of spoon-like. I want it flat and made to scrape a bowl. 19. Mini Pitcher – I have one I bought for $1.99 at Ross and I see them in all shapes there frequently. I use it for salad dressing and sauces for pancakes and waffles. 20. Cheese and Crackers – I love food and I especially love non-dessert food around the holidays, when I feel like it’s just one sweetsy thing after another. Grab a wedge of brie or blue cheese or something else fun (my grocery store always has these wedges of cranberry marbled goat cheese) and a box of crackers. Ta-da! 21. Wrapping Paper – If you’re going to a before-Christmas gift exchange, I think this would be a HOT item. My local Ross has double rolls packaged together for $3.99. The Dollar Store is also a great place to pick up a cheap roll of paper. 22. Groupon certificate – With Groupon gift card, they can get double the mileage out of $5. And they can pick their own item. 23. Bobby Pins – Somewhere in this world is an enormous pile of my lost bobby pins. Nothing walks off faster than these do. I am particularly fond of the ones that curve a little bit, so that they don’t stick straight out of the top of my head. $1.99. 24. Magnetic jars – These would be so great to keep kitchen misc in (whole spices or twist-ties) or desk items (paperclips or thumbtacks) or bathroom things (earrings, pills). 3 for $4.99. 26. Water Bottle. Who wants an ugly disposable water bottle, when you can use something this pretty? Old Navy usually has them for $5 or less and they come in many fun designs. 27. Bounce Dryer Bar – I know, I know. But seriously, I love this thing. $4.27 and you never have to deal with dryer sheets again, plus your laundry smells great. 28. Magazine Subscription – I love getting things in the mail and I really love getting magazines. I’d particularly enjoy Family Fun, Better Homes and Gardens, or Taste of Home (okay, okay, Taste of Home is $5.40. Cut me some slack). 29. Stamps – Who doesn’t need stamps? Especially at Christmas. Pick out a sheet of pretty ones for less $10 and use it for two gifts. There are many holiday ones, but I’m particularly fond of these King and Queen of Hearts ones. 30. Vase – Unless your husband regularly brings you home dozens of flowers, most of the time you need a small vase that doesn’t make three or four flowers look stupid. This vase is perfect. And $1.99. 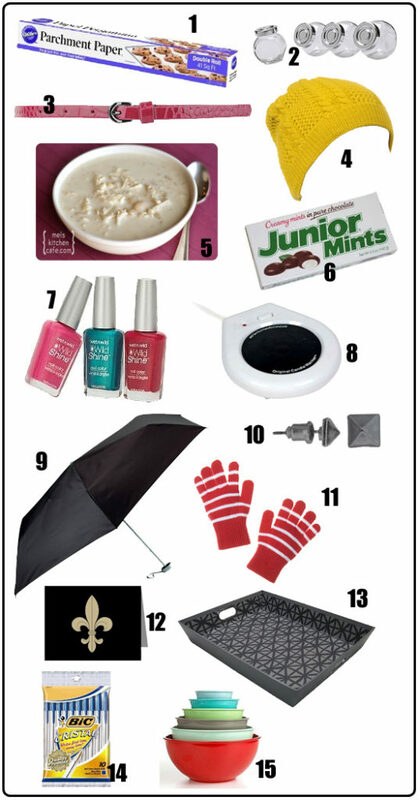 And if this wasn’t enough, go check out Kayla’s suggestions – thirty more things for under $5. Stocking stuffers, anyone? Also, if you’re buying things online, might I strongly suggest you sign up for Ebates? You get a $10 Target gift card or $5 cash when you sign up and make a purchase, and then percentages back whenever you shop through their site. I’ve used it for years and have nothing but glowing things to say about not only the concept, but also their fabulous customer service. I love how you and Kayla both came up with very different things. All very awesome, of course. You guys are so cool. Also, jealous that Austin has so many fun party-throwers. Also, I love how many of your items revolve around food. I mean, parchment paper? You are too cool. Brilliant! I'm terrible at coming up with good gifts and I dread the $5 gift- I usually would rather have no gift than get a $5 something to increase my pile of "stuff". Those are such good ideas, and I'm with you on the parchment paper! These are great options! Although, I've never actually had to take a "$5 or less" gift anywhere. Maybe I don't get out enough. Anyway, I'd add Burt's Bees chapstick to the list. Can't have too many tubes of that! Great ideas thanks to you and Kayla! To go along with your parchment paper idea is crock pot liners, the are kind of expensive but sooo nice to have. I'm curious which one(s) you ended up choosing for the parties you are going to. Mmmm, Junior Mints of happiness . . .
What a great list! You've definitely got a creative mind AND know how to shop.